For the section of the White House for which the show is named, see West Wing. The West Wing is an American serial political drama television series created by Aaron Sorkin that was originally broadcast on NBC from September 22, 1999, to May 14, 2006. The series is set primarily in the West Wing of the White House, where the Oval Office and offices of presidential senior staff are located, during the fictitious Democratic administration of Josiah Bartlet. The West Wing was produced by Warner Bros. Television and featured an ensemble cast, including Martin Sheen, John Spencer, Allison Janney, Rob Lowe, Bradley Whitford and Richard Schiff. For the first four seasons, there were three executive producers: Sorkin (lead writer of almost all of the first four seasons), Thomas Schlamme (primary director), and John Wells. After Sorkin left the series, Wells assumed the role of head writer, with later executive producers being directors Alex Graves and Christopher Misiano (seasons 6–7), and writers Lawrence O'Donnell Jr. and Peter Noah (season 7). The West Wing is regarded as one of the greatest and most influential television series. It has been ranked among the best television shows of all time in publications such as, Time, TV Guide, Empire, Rolling Stone, and the New York Daily News. The Writers Guild of America ranked it no. 10 in its "101 Best-Written TV Series" list. It has received praise from critics, political science professors, and former White House staffers and has been the subject of critical analysis. The West Wing received a multitude of accolades, including two Peabody Awards, three Golden Globe Awards, and 26 Primetime Emmy Awards, including the award for Outstanding Drama Series, which it won four consecutive times from 2000–2003. The show's ratings waned in later years following the departure of series creator Sorkin after the fourth season (Sorkin wrote or co-wrote 85 of the first 88 episodes), yet it remained popular among high-income viewers, a key demographic for the show and its advertisers, with around 16 million viewers. The West Wing employed a broad ensemble cast to portray the many positions involved in the daily work of the federal government. The President, the First Lady, and the President's senior staff and advisers form the core cast. Numerous secondary characters, appearing intermittently, complement storylines that generally revolve around this core group. Josiah "Jed" Bartlet (Martin Sheen) is the President of the United States. An economist by training, he is a former Congressman and Governor from New Hampshire who unexpectedly won the Democratic Party nomination. He suffers from multiple sclerosis, a fact he initially hides from the electorate. He is succeeded by Matt Santos (regular: seasons 1–7). Leo McGarry (John Spencer) is Bartlet's close personal friend and Chief of Staff. Following a heart attack, he becomes Counselor to the President, and later the Democratic Candidate for Vice President. He dies before assuming office (regular: seasons 1–7). Josh Lyman (Bradley Whitford) is the Deputy Chief of Staff to Leo McGarry. Josh later leaves the White House to become the "Santos for President" campaign manager. When Santos is elected, Josh becomes White House Chief of Staff (regular: seasons 1–7). Toby Ziegler (Richard Schiff) is the Communications Director, where he wrote many of Bartlet's speeches, including both Inaugural Addresses and many State of the Union Addresses. He is fired from the Bartlet administration during a leak investigation, though he is pardoned for his crimes at series' end. He has twin children with his ex-wife who is a congresswoman from Maryland (regular: seasons 1–7). Sam Seaborn (Rob Lowe) is the Deputy Communications Director to Toby Ziegler. In his time at the White House, Sam is responsible for writing many of Bartlet's speeches. He departs the White House following the re-election of President Bartlet to run for Congress. He is recruited to become Santos' Deputy Chief of Staff at the series end (regular: seasons 1–4, guest star: season 7). C.J. Cregg (Allison Janney) is the Press Secretary. She succeeds Leo McGarry as Chief of Staff and departs the White House at the end of the Bartlet administration. Post-series, she marries Danny Concannon and has a child (regular: seasons 1–7). Charlie Young (Dulé Hill) is originally the Personal Aide to the President and later a Deputy Special Assistant to the Chief of Staff. He is in a relationship with Zoey Bartlet. At the series end he begins to study law at Georgetown (regular: seasons 1–7). Donna Moss (Janel Moloney) is the Senior Assistant to Josh Lyman. She later departs to be a spokesperson for the Russell campaign and then the Santos campaign. Upon Santos' election, she becomes Chief of Staff to the First Lady (recurring: season 1; regular: seasons 2–7). Abbey Bartlet (Stockard Channing) is the First Lady, Jed's wife, and a physician. (recurring: seasons 1–2, regular: seasons 3–7 ). Mandy Hampton (Moira Kelly) is Josh Lyman's ex-girlfriend and a media consultant contracted by the Bartlet administration. She departs without explanation following the first season (regular: season 1). Will Bailey (Joshua Malina) is initially hired as a speechwriter and transitions into the role of Deputy Communications Director. He later becomes Chief of Staff to the Vice President, Russell's Campaign Manager, and Communications Director. After the series end he becomes a congressman for Oregon (regular: seasons 4–7). Kate Harper (Mary McCormack) is the Deputy National Security Advisor (recurring: season 5; regular: seasons 6–7). Matt Santos (Jimmy Smits) is a Congressman from Texas who is convinced by Josh Lyman to run for President. He eventually wins the nomination and later the election. (regular: seasons 6–7). Arnold Vinick (Alan Alda) is a Senator from California who becomes the Republican nominee for President. After his loss in the general election, he is appointed Secretary of State by President-elect Santos (regular: seasons 6–7). Annabeth Schott (Kristin Chenoweth) is Deputy Press Secretary and later works on the Santos campaign. At the series end, she is appointed Press Secretary to the incoming First Lady (recurring: season 6; regular: season 7). Each of the principal actors made approximately $75,000 per episode, with Sheen's confirmed salary being $300,000. Rob Lowe left the series in the fourth season reportedly due to not getting a salary increase. Disparities in cast salaries led to very public contract disputes, particularly by Janney, Schiff, Spencer, and Whitford. During contract negotiations in 2001, the four were threatened with breach of contract suits by Warner Bros. However, by banding together, they were able to persuade the studio to more than double their salaries. Two years later, the four again demanded a doubling of their salaries, a few months after Warner Bros had signed new licensing deals with NBC and Bravo. John Spencer died of a heart attack on December 16, 2005, about a year after his character experienced a nearly fatal heart attack on the show. Martin Sheen gave a brief memorial message before "Running Mates", the first new episode that aired after Spencer's death. The loss of Spencer's character was addressed beginning with the episode "Election Day", which aired on April 2, 2006. In an interview on the season 1 DVD, Bradley Whitford said that he was originally cast as Sam, even though Aaron Sorkin had created the Josh character specifically for him. In the same interview, Janel Moloney stated she had originally auditioned for the role of C.J. and that Donna, the role for which she was eventually cast, was not meant to be a recurring character. Other actors were seriously considered for other roles, including Alan Alda and Sidney Poitier for the President, Judd Hirsch for Leo, Eugene Levy for Toby, and CCH Pounder for C.J. The series was created by Aaron Sorkin, who served as executive producer for the pilot episode alongside director Thomas Schlamme and John Wells. Kristin Harms and Llewellyn Wells were producers for the pilot. Michael Hissrich acted as a co-producer. The first season proper saw the return of all of the pilot production team along with the addition of Ron Osborn and Jeff Reno as consulting producers and Rick Cleveland as a second co-producer with Robert W. Glass as an associate producer. Glass left the production team after only five episodes. Julie Herlocker joined as Associate Producer beginning with episode six. Osborn and Reno departed after nine episodes. Paul Redford served as a story editor throughout the first season. Lawrence O'Donnell worked as executive story editor for the second half of the season. With the second season, Kevin Falls became a co-executive producer. Cleveland left the production team and Redford and O'Donnell were promoted to co-producer. Peter Parnell and Patrick Caddell became co-producers and Julie Herlocker and Mindy Kanaskie became associate producers. O'Donnell was promoted again to producer five episodes into the season and Hissrich joined him twelve episodes into the season. The third season saw the departure of Parnell, Caddell, and Herlocker and the temporary absence of O'Donnell. Director Christopher Misiano became a supervising producer, Patrick Ward joined the series as an associate producer, and Eli Attie joined the writing staff as a staff writer. Redford was promoted to producer. With the thirteenth episode of the third season director Alex Graves became an additional supervising producer and Attie became a story editor. The fourth season marked the temporary departure of Hissrich. Misiano and Graves became co-executive producers alongside Falls. Attie was promoted to executive story editor and Debora Cahn became a staff writer. The fourteenth episode of the season saw Redford promoted to supervising producer and Kanaskie, Ward and Attie promoted to co-producers. The fifth season saw the departure of both Sorkin and Schlamme as executive producers. Schlamme remained attached to the series as an executive consultant. John Wells remained the sole executive producer and showrunner. Co-executive producer Kevin Falls also left the show. O'Donnell rejoined the production team as a consulting producer. Wells also added Carol Flint, Alexa Junge, Peter Noah, and John Sacret Young as consulting producers. Andrew Stearn came aboard as a producer and Attie was promoted to producer. Cahn became story editor and Josh Singer replaced her as staff writer. With the tenth episode Flint, Junge, Noah and Sacret Young became supervising producers. With the sixth season Misiano and Graves were promoted to executive producers. Redford and Junge left the production team and Dylan K. Massin became a co-producer. Cahn was promoted to executive story editor and Singer replaced her as story editor. Lauren Schmidt filled the staff writer role. The fourth episode saw the departure of original crew member Llewellyn Wells. Debora Cahn was promoted to co-producer with the fourteenth episode. The seventh season saw Noah and O'Donnell promoted again, this time becoming additional executive producers. Attie became a supervising producer. Hissrich returned to his role as producer for the final season. The West Wing, like many serial dramas, stretches storylines over several episodes or entire seasons. In addition to these larger storylines, each episode also contains smaller arcs that usually begin and end within an episode. Most episodes follow President Bartlet and his staff through particular legislative or political issues. Plots can range from behind-closed-doors negotiating with Congress to personal problems like post-traumatic stress disorder, from which Josh suffers during the second season. The typical episode loosely follows the President and his staff through their day, generally following several plots connected by some idea or theme. A large, fully connected set of the White House allowed the producers to create shots with very few cuts and long, continuous master shots of staff members conversing as they walk through the hallways. These "walk and talks" became a trademark of the show. The final two seasons presented a narrative change, with the focus of the show divided between plots in the West Wing with President Bartlet and his remaining senior staffers and plots revolving around the rest of the main cast on the campaign trail for the 2006 election. In the first season, the Bartlet administration is in its second year and is still having trouble settling in and making progress on legislative issues. The second season covers the aftermath of a shooting at Rosslyn, the 2000 midterm elections and dealings with a new Congress, and sees scandal when the White House is rocked by allegations of criminal conduct and the President must decide whether he will run for a second term. The third and fourth seasons take an in-depth look at the campaign trail and the specter of both foreign and domestic terrorism. In the fifth season, the President begins to encounter more issues on the foreign front, while at home he faces off with the newly elected Speaker of the House, battles controversy over Supreme Court appointments and oversees a daring plan to save Social Security. The sixth season chronicles the quest to replace President Bartlet in the next election, following the primary campaigns of several candidates from both parties, while the President himself attempts to build his legacy, but finds his ability to govern compromised by his illness. In the seventh season, the President must face a leak of confidential information about a secret Department of Defense program from inside the White House, while the Democratic and Republican candidates battle to succeed him in the general election. The series developed following the success of 1995 theatrical film The American President, for which Aaron Sorkin wrote the screenplay, and in which Martin Sheen played the White House Chief of Staff. Unused plot elements from the film and a suggestion from Akiva Goldsman inspired Sorkin to create The West Wing. According to the DVD commentary, Sorkin intended to center the show on Sam Seaborn and the other senior staff with the President in an unseen or a secondary role. However, Bartlet's screen time gradually increased, and his role expanded as the series progressed. Positive critical and public reaction to Sheen's performance raised his character's profile, decreasing Lowe's perceived significance. In addition, according to Sorkin, the storylines began to focus less on Sam and more on Josh Lyman, the Deputy Chief of Staff. This shift was one of the reasons for Lowe's eventual departure from the show in the fourth season. For the first four seasons, drawing on research materials, scene drafts, and occasionally entire draft scripts from his writing staff, Sorkin wrote almost every episode of the series, occasionally reusing plot elements, episode titles, character names, and actors from his previous work, Sports Night, a sitcom in which he began to develop his signature dialogue style of rhythmic, snappy, and intellectual banter. Fellow executive producer and director Thomas Schlamme championed the walk and talk, a continuous shot tracking in front of the characters as they walk from one place to another that became part of The West Wing's signature visual style. Sorkin's hectic writing schedule often led to cost overruns and schedule slips, and he opted to leave the show after the fourth season, following increasing personal problems, including an arrest for possession of hallucinogenic mushrooms. Thomas Schlamme also left the show after the fourth season. John Wells, the remaining executive producer, took the helm after their departure. The West Wing aired on Wednesdays at 9:00 pm ET from its debut until the end of its sixth season. NBC elected to move the series to Sundays at 8:00 pm for its seventh season, a move universally regarded as the beginning of the series' end (since NBC and the NFL had reached a deal for Sunday Night Football to return to the network in fall 2006), and the series finale aired on May 14, 2006. The West Wing took a large ratings hit with the move, which put it up against ABC's Top 20 hit Extreme Makeover: Home Edition, and CBS' Top 30 hit Cold Case in its timeslot. The West Wing offers a glimpse into the inner workings of the fictional Bartlet White House. The show's legitimacy, political slant, and idealist representations of Washington, as well as its notable writing and film merits, have generated considerable discussion. While The West Wing is not completely accurate in its portrayal of the actual West Wing, former White House staffers described the show as capturing the feel of the real West Wing. However, President Gerald Ford's daughter Susan made the comment "I can't watch [the show]. They turn left and right where you are not supposed to." Former Senate aide Lawrence O'Donnell and former White House aide and presidential campaign speechwriter Eli Attie were both longtime writers on the show (O'Donnell for seasons 1–2 and 5–7, Attie for seasons 3–7). Former White House Press Secretaries Dee Dee Myers and Marlin Fitzwater and pollsters Patrick Caddell and Frank Luntz also served as consultants, advising the writing staff for part of the show's run. Other former White House staffers, such as Peggy Noonan and Gene Sperling, served as consultants for brief periods. A documentary special in the third season compared the show's depiction of the West Wing to the real thing. Many former West Wing denizens applauded the show's depiction of the West Wing, including advisor David Gergen, Secretary of State Henry Kissinger, Chief of Staff Leon Panetta, Deputy Chief of Staff Karl Rove, and former Presidents Gerald Ford, Jimmy Carter, and Bill Clinton. While critics often praised The West Wing for its writing, others faulted the show as unrealistically optimistic and sentimental. A large part of this criticism came from the perceived naiveté of the characters. Television critic Heather Havrilesky asked, "What rock did these morally pure creatures crawl out from under and, more important, how do you go from innocent millipede to White House staffer without becoming soiled or disillusioned by the dirty realities of politics along the way?" Despite acclaim for the veracity of the series, Sorkin believed, "our responsibility is to captivate you for however long we've asked for your attention." Former White House aide Matthew Miller noted that Sorkin "captivates viewers by making the human side of politics more real than life—or at least more real than the picture we get from the news." Miller also noted that by portraying politicians with empathy, the show created a "subversive competitor" to the cynical views of politics in media. In the essay "The West Wing and the West Wing", author Myron Levine agreed, stating that the series "presents an essentially positive view of public service and a healthy corrective to anti-Washington stereotypes and public cynicism." Dr. Staci L. Beavers, associate professor of political science at California State University, San Marcos, wrote a short essay, "The West Wing as a Pedagogical Tool". She concluded, "While the series' purpose is for-profit entertainment, The West Wing presents great pedagogical potential." The West Wing, in her opinion, gave greater depth to the political process usually espoused only in stilted talking points on shows like Face the Nation and Meet the Press. However, she noted that the merits of a particular argument may be obscured by the viewer's opinion of the character. Beavers also noted that characters with opposing viewpoints were often set up to be "bad people" in the viewer's eyes. These characters were assigned undesirable characteristics having nothing to do with their political opinions, such as being romantically involved with a main character's love interest. In Beavers' opinion, a critical analysis of the show's political views can present a worthwhile learning experience to the viewer. While it aired, The West Wing offered viewers an idealist liberal administration that provided a sort of catharsis to those on the left who felt that their political beliefs were largely forgotten or ignored in the era of the Bush administration. Writer Hédi Kaddour remarked that The West Wing "show[ed] what [liberals] would have liked to have seen and had: a different American administration, closer to our desires as people more or less on the left." One of the stranger effects of the show occurred on January 31, 2006, when The West Wing was said to have played a hand in defeating a proposal backed by Tony Blair's government in the British House of Commons, during the so-called "West Wing Plot". The plan was allegedly hatched after a Conservative Member of Parliament watched the episode "A Good Day", in which Democrats block a bill aimed at limiting stem cell research, by appearing to have left Washington D.C. but actually hiding in a congressional office until the Republican Speaker calls the vote. A number of episodes referred to a practice of the administration having one day each year on which they accepted meetings with people or groups who would not normally receive an audience with high-level White House staffers, referring to the event as "Big Block of Cheese Day". The name came from the fact that President Andrew Jackson had a large wheel of cheese placed in the White House from which the public were invited to eat during a reception, while discussing issues of the day with politicians. In 2014, the White House announced that it was to host an online Q&A with Obama administration officials and staff, called a Virtual "Big Block of Cheese day", on January 29, 2014. The event was promoted with a video featuring stars from The West Wing. The event was repeated on January 21, 2015, again promoted by stars from the show. On April 29, 2016, Allison Janney appeared in character as C.J. Cregg during a White House press briefing. Despite its commercial and critical success, The West Wing has also received criticism from the left. Jewish Journal columnist Naomi Pfefferman once referred to The West Wing as "The Left Wing" because of its portrayal of an ideal liberal administration, and the moniker has also been used by Republican critics of the show. Chris Lehmann, former deputy editor and regular reviewer for The Washington Post's Book World section, characterized the show as a revisionist look at the Clinton presidency. Other critics have taken issue with the portrayal of conservatives on the show, criticizing The West Wing for a form of liberal elitism, as writer Luke Savage remarked, "there is a general tenor to The West Wing universe that cannot be called anything other than smug." The hosts of socialist podcast Chapo Trap House are frequent critics of Sorkin and have called The West Wing an "expression of the patronizing self-entitlement of liberals." On the other hand, some Republicans have admired the show since its inception, even before the departure of Sorkin and the show's resulting shift toward the center. In his 2001 article "Real Liberals versus The West Wing," Mackubin Thomas Owens wrote, ″Although his administration is reliably liberal, President Bartlet possesses virtues even a conservative could admire. He obeys the Constitution and the law. He is devoted to his wife and daughters. Being unfaithful to his wife would never cross his mind. He is no wimp when it comes to foreign policy—no quid pro quo for him." Journalist Matthew Miller wrote, "although the show indeed has a liberal bias on issues, it presents a truer, more human picture of the people behind the headlines than most of today's Washington journalists." Sam Seaborn and Josh Lyman converse in the hallway in one of The West Wing's noted tracking shots. In its first season, The West Wing attracted critical attention in the television community with a record nine Emmy wins. The show has been praised for its high production values and repeatedly recognized for its cinematic achievements. The series had a budget of $2.7 million per episode. The series has also been praised for Sorkin's rapid-fire and witty scripts. The West Wing is noted for developing the "walk-and-talk"—long Steadicam tracking shots showing characters walking down hallways while involved in long conversations. In a typical "walk-and-talk" shot, the camera leads two characters down a hallway as they speak to each other. One of these characters generally breaks off and the remaining character is then joined by another character, who initiates another conversation as they continue walking. These "walk-and-talks" create a dynamic feel for what would otherwise be long expository dialogue, and have become a staple for dialogue-intensive television show scenes. In its first season, The West Wing garnered nine Emmys, a record for most won by a series in its first season. In addition, the series received the Emmy Award for Outstanding Drama Series in 2000, 2001, 2002, and 2003, tying Hill Street Blues, L.A. Law and Mad Men for most won in this category. Each of its seven seasons earned a nomination for the award. With its 26 total awards, The West Wing tied with Hill Street Blues as the drama with the most Emmy wins until Game of Thrones broke the record for most wins in 2016, with 35 total awards. The series shares the Emmy Award record for most acting nominations by regular cast members (excluding the guest performer category) for a single series in one year. (Both Hill Street Blues and L.A. Law also hold that record). For the 2001–2002 season, nine cast members were nominated for Emmys. Allison Janney, John Spencer and Stockard Channing each won an Emmy (for Lead Actress, Supporting Actor and Supporting Actress respectively). The others nominated were Martin Sheen (for Lead Actor), Richard Schiff, Dulé Hill and Bradley Whitford (for Supporting Actor), and Janel Moloney and Mary-Louise Parker (for Supporting Actress). In addition, that same year Mark Harmon, Tim Matheson and Ron Silver were each nominated in the Guest Actor category (although none won the award). This gave the series an Emmy Award record for most acting nominations overall (including guest performer category) in a single year, with 12 acting nominations. Twenty individual Emmys were awarded to writers, actors, and crew members. Allison Janney is the record holder for most wins by a cast member, with a total of four Emmys. The West Wing won at least one Emmy in each of its seasons except the sixth. In addition to its Emmys, the show won two Screen Actors Guild (SAG) Awards, in 2000 and 2001, Outstanding Performance by an Ensemble in a Drama Series. Martin Sheen was the only cast member to win a Golden Globe Award, and he and Allison Janney were the only cast members to win SAG Awards. In both 1999 and 2000, The West Wing was awarded the Peabody Award for excellence in broadcasting. Many cast members were Emmy-nominated for their work on The West Wing but did not win, including Martin Sheen—who was nominated for six of the seven seasons of the series without receiving the award—as well as Janel Moloney, who was nominated twice, and Dulé Hill, Rob Lowe, and Mary-Louise Parker, who were all nominated once. Matthew Perry, Oliver Platt, Ron Silver, Tim Matheson, and Mark Harmon also received Emmy nominations for guest starring on the show. Tommy Schlamme won two Emmys for Outstanding Directing for a Drama Series (in 2000 and 2001), and Christopher Misiano won an Emmy for Outstanding Directing for a Drama Series in 2003. The West Wing's only Emmy for Outstanding Writing for a Drama Series was in its first season, when Rick Cleveland and Aaron Sorkin shared the award for "In Excelsis Deo". W. G. Snuffy Walden received an Emmy Award for Outstanding Main Title Theme Music in 2000 for "The West Wing Opening Theme". "The West Wing Documentary Special" won an Emmy Award for Outstanding Special Class Program in 2002, with the award shared by Aaron Sorkin, Tommy Schlamme, documentarian Bill Couturie, show writers Eli Attie and Felicia Willson, and others. Readers of TV Guide voted the cast of The West Wing their Best Drama cast of all time, receiving 37% of the votes, beating Lost, which received 23%. A Wall Street Journal poll in 2016 named Martin Sheen's Josiah Bartlet as the second greatest fictional president, behind Harrison Ford's President James Marshall in Air Force One. The West Wing often featured extensive discussion of current or recent political issues. After the real-world election of Republican President George W. Bush in 2000, many wondered whether the liberal show could retain its relevance and topicality. However, by exploring many of the same issues facing the Bush administration from a Democratic point of view, the show continued to appeal to a broad audience of both Democrats and Republicans. In the second-season episode "The Midterms", President Bartlet admonishes fictional radio host Dr. Jenna Jacobs for her views regarding homosexuality at a private gathering at the White House. Dr. Jacobs is a caricature of radio personality Dr. Laura Schlessinger, who strongly disapproves of homosexuality. Many of the President's biblical references in his comments to Dr. Jacobs appear to have come from an open letter to Dr. Schlessinger, circulated online in early May 2000. For the first time on national television or even in film, the public encountered a lead character with both an MS diagnosis and the hope for a continued productive life. Because [The] West Wing is a fictional drama and not a medical documentary, writers could have greatly distorted MS facts to further their story line [but did not]. Following the September 11, 2001 attacks, the start of the third season was postponed for a week, as were most American television premieres that year. A script for a special episode was quickly written and began filming on September 21. The episode "Isaac and Ishmael" aired on October 3 and addresses the sobering reality of terrorism in America and the wider world, albeit with no specific reference to September 11. While "Isaac and Ishmael" received mixed critical reviews, it illustrated the show's flexibility in addressing current events. The cast of the show state during the opening of the episode that it is not part of The West Wing continuity. While the September 11 attacks are not referenced in The West Wing continuity, the country enters into a variation of the War on Terrorism. Al Qaeda, mentioned briefly by Nancy McNally in the beginning of Season 2, plays no role in the longer terrorism story arcs of Seasons 3, 4 and 5. It is only mentioned again in Seasons 6 and 7. The stand-in used instead is the fictional Bahji terror group who first plots to blow up the Golden Gate Bridge. In response, the President orders the assassination of foreign leader Abdul ibn Shareef, one of Bahji's primary backers. This storyline has similarities to the real-world U.S. invasion of Afghanistan as well as U.S. relations with Saudi Arabia, as it brings the Middle East to the forefront of U.S. foreign relations and elevates terrorism as a serious threat. In the middle of the fourth season, Bartlet's White House is confronted with genocide in the fictional African country of Equatorial Kundu, which was compared to the Rwandan Genocide of 1994. The result is new foreign policy doctrine for the Bartlet Administration and military intervention to stop the violence, which come after much hesitation and reluctance to call the conflict a genocide. In reality, the Clinton Administration did not intervene in Rwanda. In the sixth and seventh seasons, The West Wing explores a leak of top-secret information by a senior staffer at the White House. This leak has been compared to events surrounding the Valerie Plame affair. In the storyline, the International Space Station is damaged and can no longer produce oxygen for the astronauts to breathe. With no other methods of rescue available, the President is reminded of the existence of a top-secret military space shuttle. Following the President's inaction, the shuttle story is leaked to a White House reporter, Greg Brock (analogous to Judith Miller), who prints the story in The New York Times. Brock will not reveal his source and goes to jail for failing to do so, as did Miller. In order to stop the investigation, in which authorities suspect Chief of Staff C.J. Cregg, Toby Ziegler admits to leaking the information, and the President is forced to dismiss him. In comparison, the Plame affair resulted in the arrest and conviction of "Scooter" Libby, the Vice President's chief of staff. However, Libby was convicted of perjury in testimony to a grand jury. No one was convicted for "blowing the cover" of Plame. (Richard Armitage, an official in the Bush State Department, acknowledged leaking information about Plame to reporters but was never charged with a crime.) Libby's two and a half-year prison sentence was later commuted by President Bush, though the other facet of his sentence ($250,000 fine) stood until his 2018 pardon by President Donald Trump and was duly paid. In the series finale, President Bartlet, as his last official act, pardons Ziegler. All contemporary domestic government officials in The West Wing universe are fictional. President Bartlet has made three appointments to the fictional Supreme Court and maintains a full cabinet, although not all names and terms of the members are revealed. Some cabinet members, such as the Secretary of Defense, appear more often than others. Many other government officials, such as mayors, governors, judges, representatives, and senators, are mentioned and seen as well. San Andreo is a fictional California city. It is located near San Diego, has a population of 42,000 and is the location of the San Andreo Nuclear Generating Station. The fictional station was based on the real life San Onofre Nuclear Generating Station in San Diego County. A near meltdown at the nuclear plant becomes the focus of an October surprise for Republican nominee Senator Arnold Vinick during the 2006 presidential election, due to Vinick's strong pro-nuclear stance and revelations of his active lobbying for the construction of the plant. This is seen to be a key factor in Vinick's narrow defeat in the election by Democratic nominee Congressman Matt Santos. Hartsfield's Landing is a fictional town in New Hampshire. It is stated to be a very small community of only 63 people, of whom 42 are registered voters, that votes at one minute past midnight on the day of the New Hampshire primary, hours before the rest of the state, and has accurately predicted the winner of every presidential election since William Howard Taft in 1908. It is based on the true New Hampshire communities of Hart's Location and Dixville Notch, which indeed vote before the rest of the state during the primaries, and also loosely upon the concept of "bellwether states" in US presidential elections. Kennison State is a fictional university in Cedar Rapids, Iowa, used as the setting of a bombing in the beginning of the fourth season. While several real-world leaders exist in the show's universe, most foreign countries depicted or referred to on the show have fictional rulers. Real people mentioned in The West Wing include Muammar Gaddafi, Yasser Arafat, Fidel Castro, Queen Elizabeth II, King Bhumibol Adulyadej, King Carl XVI Gustaf, Thabo Mbeki and Osama bin Laden. Qumar is a fictional, oil-rich, powerful, Middle Eastern state. A former British protectorate now ruled by a sultan and his family, it hosts a major US airbase and is frequently a source of trouble for the Bartlet administration. The nation is first introduced in the third season as a close ally of the United States but is criticized for its harsh treatment of women. After the September 11 attacks, it became a major venue for the show's terrorism subplots, including one where convincing evidence is discovered that Qumari Defense Minister Shareef is planning terrorist acts against U.S. infrastructure, including a failed conspiracy to destroy the Golden Gate Bridge, and President Bartlet authorizes his assassination by a covert operations team. Geographically, as it is depicted on maps, it roughly corresponds to the Hormozgan Province of Iran. Equatorial Kundu is a fictional African nation blighted by AIDS and a civil war, resembling the 1994 Rwandan genocide. Its location, when depicted on maps, is roughly that of Equatorial Guinea. Equatorial Kundu is also used during the third season of Sorkin's later television series The Newsroom. The West Wing universe diverges from history after Richard Nixon's presidency, although there is occasional overlap; for instance, in the second episode of the series' second season "In the Shadow of Two Gunmen" Toby Ziegler speaks to a Secret Service agent outside a building named for Ronald Reagan, although this may have just been a production oversight. Fictional Presidents who are shown to have served between Nixon and Bartlet include one-term Democrat D. Wire Newman (James Cromwell) and two-term Republican Owen Lassiter. Leo McGarry is mentioned as being Labor Secretary in the administration that was in office in 1993 and 1995. In the first season, an outgoing Supreme Court Justice tells Jed Bartlet that he had been wanting to retire for five years, but waited "for a Democrat" because he did not want a Republican President to replace him with a conservative justice (the Justice then tells President Bartlet, snidely, "Instead, I got you."). The season four episode "Debate Camp" features a flashback to the days just before Bartlet's inauguration, as Donna Moss meets with her Republican predecessor, Jeff Johnson. In season six Leo says that the Republicans have been "out of power for eight years", and Republicans at their convention say "eight (years) is enough". The passage of time on the show relative to that of the real world is somewhat ambiguous when marked by events of shorter duration (e.g., votes, campaigns). Sorkin noted in a DVD commentary track for the second-season episode "18th and Potomac" that he tried to avoid tying The West Wing to a specific period of time. Despite this, real years are occasionally mentioned, usually in the context of elections and President Bartlet's two-term administration. The show's presidential elections are held in 2002 and 2006, which are the years of the midterm elections in reality (these dates come from the fact that in the season 2 episode "17 People", Toby specifically mentions 2002 as the year of the President's reelection campaign). The election timeline in The West Wing matches up with that of the real world until early in the sixth season, when it appears that a year is lost. For example, the filing deadline for the New Hampshire primary, which would normally fall in January 2006, appears in an episode airing in January 2005. In an interview, John Wells stated that the series began one and a half years into Bartlet's first term and that the election to replace Bartlet was being held at the correct time. However, the season 1 episode "He Shall from Time to Time" shows the preparations for Bartlet's first regular State of the Union address, which would occur one year into his presidency. In the Season 1 episode "Let Bartlet Be Bartlet", Josh Lyman asks Toby Ziegler, "Our second year isn't going much better than our first year, is it?" In the season 5 episode "Access", it is mentioned that the Casey Creek crisis occurred during Bartlet's first term and got his presidency off to a calamitous start, and network footage of the crisis carries the date of November 2001. Bartlet's first campaign for President is never significantly explored in the series. Bartlet is stated to have won the election with 48% of the popular vote, 48 million votes, and a 303–235 margin in the Electoral College. Of three debates between Bartlet and his Republican opponent, it is mentioned that Bartlet won the third and final debate, held eight days before election day in St. Louis, Missouri. 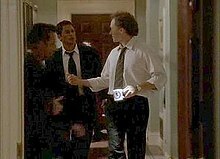 Josh Lyman says that in the days prior to the election "Bartlet punched through a few walls" as the result seemed too close to call, before the result broke his way. Leo McGarry says the same thing in "Bartlet for America" when he says, "It was eight days to go, and we were too close to call". The campaign for the Democratic nomination is extensively addressed. In the episodes "In the Shadow of Two Gunmen, Part I", "In the Shadow of Two Gunmen, Part II" and "Bartlet for America", flashbacks are used to show Bartlet defeating Texas Senator John Hoynes (Tim Matheson) and Washington Senator William Wiley for the Democratic nomination and later choosing Hoynes as his running mate. The flashbacks also show Leo McGarry persuading Bartlet, then Governor of New Hampshire, to run for President. The West Wing's 2002 presidential election puts Bartlet and Vice President John Hoynes against Florida Governor Robert Ritchie (James Brolin) and his running mate, Jeff Heston. Bartlet faces no known opposition for renomination, though Minnesota Democratic Senator Howard Stackhouse launches a brief independent campaign for the presidency. Ritchie, not originally expected to contend for the nomination, emerges from a field of seven other Republican candidates by appealing to the party's conservative base with simple, "homey" sound bites. Bartlet's staff contemplates replacing Vice President John Hoynes on the ticket with Chairman of the Joint Chiefs of Staff Admiral Percy Fitzwallace (John Amos), among others. After it is clear that Ritchie will be the Republican nominee, Bartlet dismisses the idea, declaring that he wants Hoynes in the number two spot because of "four words," which he writes down and hands to Hoynes and McGarry to read: "Because I could die." Throughout the season it is anticipated that the race will be close, but a stellar performance by Bartlet in the sole debate between the candidates helps give Bartlet a landslide victory in both the popular and electoral vote. A speed-up in The West Wing's timeline, in part due to the expiration of many cast members' contracts and a desire to continue the program with lower production costs, resulted in the omission of the 2004 midterm elections and an election during the seventh season. The sixth season extensively details the Democratic and Republican primaries. The seventh season covers the lead-up to the general election, the election, and the transition to a new administration. The timeline slows down to concentrate on the general election race. The election, normally held in November, takes place across two episodes originally broadcast on April 2 and 9, 2006. Congressman Matt Santos (D-TX) (Jimmy Smits) is nominated on the fourth ballot at the Democratic National Convention, during the sixth-season finale. Santos, having planned to leave Congress before being recruited to run for the presidency by Josh Lyman, polls in the low single digits in the Iowa caucus. He is virtually out of the running in the New Hampshire primary before a last-ditch live television commercial vaults him to a third-place finish with 19% of the vote. Josh Lyman, Santos's campaign manager, convinces Leo McGarry to become Santos' running mate. Senator Arnold Vinick (R-CA) (Alan Alda) secures the Republican nomination, defeating Glen Allen Walken (John Goodman) and the Reverend Don Butler (Don S. Davis), among others. Initially, Vinick wants Butler to become his running mate. However, Butler does not want to be considered because of Vinick's stance on abortion. Instead, West Virginia Governor Ray Sullivan (Brett Cullen) is chosen as Vinick's running mate. Vinick is portrayed throughout the sixth season as virtually unbeatable because of his popularity in California, a typically Democratic state, his moderate views, and his wide crossover appeal. Vinick, however, faces difficulty with the pro-life members of his party as a pro-choice candidate, and criticism for his support of nuclear power following a serious accident at a Californian nuclear power station. On the evening of the election, Leo McGarry suffers a massive heart attack and is pronounced dead at the hospital, with the polls still open on the West Coast. The Santos campaign releases the information immediately, while Arnold Vinick refuses to use Leo's death as a "stepstool" to the presidency. Santos emerges as the winner in his home state of Texas, while Vinick wins his home state of California. The election comes down to Nevada, where both candidates need a victory to secure the presidency. Vinick tells his staff repeatedly that he will not allow his campaign to demand a recount of the votes if Santos is declared the winner. Josh Lyman gives Santos the same advice, although the Santos campaign sends a team of lawyers down to Nevada. Santos is pronounced the winner of the election, having won Nevada by 30,000 votes, with an electoral margin of 272–266. According to executive producer Lawrence O'Donnell, Jr., the writers originally intended for Vinick to win the election. However, the death of Spencer forced him and his colleagues to consider the emotional strain that would result from having Santos lose both his running mate and the election. It was eventually decided by John Wells that the last episodes would be rescripted. Other statements from John Wells, however, have contradicted O'Donnell's claims about a previously planned Vinick victory. The script showing Santos winning was written long before the death of John Spencer. In 2008 O'Donnell stated to camera, "We actually planned at the outset for Jimmy Smits to win, that was our .. just .. plan of how this was all going to work, but the Vinick character came on so strong in the show, and was so effective, it became a real contest ... and it became a real contest in the West Wing writer's room." Similarities between the fictional 2006 election and the real-life 2008 U.S. presidential election have been noted in the media: young ethnic minority Democratic candidate (Matthew Santos on the show, Barack Obama in real life) has a gruelling but successful primary campaign against a more experienced candidate (Bob Russell on the show, Hillary Clinton in real life) and a third candidate who has been damaged by claims of infidelity (John Hoynes on the show, John Edwards in real life) and chooses an experienced Washington insider as his running mate (Leo McGarry on the show, Joe Biden in real life); whereas the Republican contest is determined early in the primary season with an aging "maverick" senator of a western state being the nominee (Arnold Vinick of California on the show, John McCain of Arizona in real life) after defeating a staunchly pro-life opponent with pastoral experience, among others (Reverend Don Butler on the show, Mike Huckabee in real life), and then choosing a younger, socially conservative running mate in the midst of his or her first term as governor of a sparsely populated, resource-rich state (Ray Sullivan of West Virginia on the show, Sarah Palin of Alaska in real life). According to David Remnick's biography of Obama, The Bridge, when writer and former White House aide Eli Attie was tasked with fleshing out the first major Santos storylines, he looked to then-U.S. Senator Obama as a model. Attie called David Axelrod, with whom he had worked in politics, "and grilled him about Obama." While Attie says that he "drew inspiration from [Obama] in drawing [the Santos] character," actor Jimmy Smits also says that Obama "was one of the people that I looked to draw upon" for his portrayal of the character. Writer and producer Lawrence O'Donnell says that he partly modeled Vinick after McCain. Obama's former Chief of Staff, Rahm Emanuel, is said to be the basis of the Josh Lyman character, who becomes Santos' Chief of Staff. However, O'Donnell denied this claim. As the series sunsets with Bartlet's final year in office, little is revealed about Matt Santos' presidency, with the last few episodes mainly focusing on the Santos team's transition into the White House. Santos chooses Josh Lyman as Chief of Staff, who in turn calls on former colleague Sam Seaborn to be Deputy Chief of Staff. In need of experienced cabinet members, Santos taps Arnold Vinick as Secretary of State, believing the senior statesman to be one of the best strategists available and respected by foreign leaders. Santos eventually decides on Eric Baker, the Democratic Governor of Pennsylvania and at one point the frontrunner for the Democratic nomination, as his choice for Vice President, and submits his name to Congress under the terms of the 25th Amendment. While the show ends before he can be confirmed, it is implied he may face little opposition from Republicans due to the backing of Secretary of State Vinick. President Bartlet's final act as President of the United States is pardoning Toby Ziegler, who had violated federal law by leaking classified information about a military space shuttle. The series ends with Bartlet returning to New Hampshire. Having said his goodbyes to his closest staff, former President Bartlet tells President Santos, "Make me proud, Mr. President," to which Santos responds, "I'll do my best, Mr. President." The series is available on DVD, with a complete series set released in 2006. In 2010 the series was released in high-definition for the first time on streaming platforms Amazon Video and iTunes, with the first two seasons remastered in 16:9 to match the aspect ratio and resolution change in the third season. Several books have been published about The West Wing. One of the first, in 2001, was Paul C. Challe's Inside the West Wing: An Unauthorized Look at Television's Smartest Show. In 2002, Newmarket Press published The West Wing Script Book, which included episode scripts from Aaron Sorkin. Also in 2002, Ian Jackman wrote The West Wing (The Official Companion). Analytical books about the series include Peter Rollins' The West Wing: The American Presidency as Television Drama (2003), The Prime-Time Presidency: The West Wing and U.S. Nationalism by Trevor Parry-Giles and Shawn J. Parry-Giles (2006), The West Wing (TV Milestones Series) by Janet McCabe (2012), and Claire Handscombe's Walk with Us: How the West Wing Changed Our Lives (2016). In 2010, Twitter accounts for many of the primary characters on The West Wing began to appear, including accounts for President Bartlet, Josh Lyman, Leo McGarry, Matt Santos and Mrs. Landingham. While Twitter accounts for fictional characters are not uncommon, The West Wing accounts are notable for mixing a fictional timeline and commentary on real world events. Tweets from the fictional characters have been featured on The Rachel Maddow Show, CNN and questions from the fictional accounts have been answered by Press Secretary Robert Gibbs during a White House Press Conference and from Vice President Joe Biden during a Twitter Town Hall. The success of The West Wing accounts has resulted in several copycats, including accounts from several minor or obscure West Wing characters, including Gail, the fish in C.J. 's office. In March 2016, The West Wing Weekly podcast hosted by Hrishikesh Hirway and Joshua Malina began. Each episode of the podcast discusses an episode of The West Wing and has featured various cast and crew members from the series. A major fan convention, "West Wing Weekend" took place in September 28–30, 2018, at the Marriott Hotel in Bethesda, Maryland. The convention featured guest appearances from some members of the series' cast, as well as a number of panels, fan-based programming, and special events. A Kickstarter campaign for the convention was started on January 4, 2018, to raise $10,000, and it was fully funded within two days. Many venues, including Funny or Die, Mad TV, and the Late Night with Seth Meyers have parodied the walk-and-talk cliche of the show, including the "ping-pong" dialogue, in which one character would speak barely a word before the other said another, and then repeated back and forth. ^ This includes the special episodes "Documentary Special" and "Isaac and Ishmael". ^ "Television Programs Presented in Dolby Digital 5.1 Receive 20 Sound-Related Emmy Nominations". Dolby. July 21, 2005. ^ Keveney, Bill (January 22, 2006). "'West Wing' to end with new president". USA Today. Retrieved February 12, 2006. ^ "The West Wing – The 100 Best TV Shows of All-TIME". Time. September 6, 2007. Retrieved March 28, 2010. ^ Roush, Matt (February 25, 2013). "Showstoppers: The 60 Greatest Dramas of All Time". TV Guide: 16–17. ^ Fretts, Bruce; Roush, Matt (December 23, 2013). "TV Guide Magazine's 60 Best Series of All Time". TV Guide. Retrieved October 22, 2015. ^ "The 50 Best TV Shows Ever". Empire. April 24, 2018. Retrieved July 16, 2018. ^ Sheffield, Rob (September 21, 2016). "100 Greatest TV Shows of All Time". Rolling Stone. Retrieved October 24, 2016. ^ Hinckley, David (August 22, 2014). "From 'Mad Men' to 'Breaking Bad,' the Top 10 dramas of all time". New York Daily News. Retrieved October 24, 2016. ^ "101 Best Written TV Series of All Time". Writers Guild of America, West. June 2, 2013. Retrieved June 3, 2013. ^ Spitzer, Gabriel (May 14, 2001). "Rich are different. They watch 'West Wing.'". Media Life. Archived from the original on August 19, 2012. Retrieved January 21, 2010. ^ a b Errico, Marcus (July 21, 2001). "Détente on West Wing Set". E! Online. Archived from the original on November 10, 2013. Retrieved December 12, 2005. ^ Armstrong, Mark (July 24, 2002). ""West Wing": Low Pay Sparks Lowe Exit". E! Online. Retrieved November 10, 2012. ^ Haberman, Lia (July 28, 2003). "West Wing Salarygate". E! Online. Retrieved November 25, 2011. ^ Keveney, Bill (December 16, 2005). "'West Wing' actor John Spencer dies". USA Today. Retrieved October 30, 2013. ^ Sassone, Bob (May 7, 2006). "A look back at The West Wing: Entertainment Weekly in 60 seconds". Aol TV. Retrieved May 19, 2006. ^ "The West Wing". TV Guide. Retrieved August 18, 2016. ^ Brooks, Tim; Marsh, Earle (2007). The Complete Directory to Prime Time Network and Cable TV Shows 1946-Present (Ninth Edition). Ballantine Books. p. 1695-1697. ISBN 978-0-345-49773-4. ^ Sorkin, Aaron. The West Wing – Pilot Script. Warner Bros.
^ "Lowe confirms West Wing exit". BBC News. July 25, 2002. Retrieved November 10, 2013. ^ Carter, Bill (September 23, 2003). "The West Wing Comes to Terms With the G.O.P." The New York Times. Retrieved December 12, 2005. ^ Rutenberg, Jim (April 18, 2001). "Sorkin Arrested". The New York Times. Retrieved October 28, 2007. ^ Adalian, Josef (May 1, 2003). "Sorkin sulking away from 'Wing': Regime change for NBC White House series". Variety. Retrieved January 7, 2012. ^ "Political drama West Wing is axed". BBC News. January 23, 2006. Retrieved September 17, 2010. ^ Pierce, Scott D. (October 8, 2005). "'West' is at its very best (subscription required)". Deseret News. Archived from the original on November 4, 2012. Retrieved September 16, 2010. ^ a b Levine, Myron A. "The West Wing and the West Wing." Reprinted in The West Wing: The American Presidency as Television Drama. Edited by Peter C. Rollins and John E. Connor. 2003. ^ a b c Miller, Matthew (March 1, 2000). "The Real White House". Brill's Content. Archived from the original on April 26, 2006. ^ Nevius, C. W. (January 22, 2004). "Just ask Chelsea, Jenna and Barbara: Escaping the glare of the spotlight isn't easy for kids whose dads work in the Oval Office". San Francisco Chronicle. Retrieved March 4, 2012. ^ Cox News Service (April 22, 2002). "'West Wing' Episode Acts As Documentary With Real-life Politicos In The Mix". Orlando Sentinel. Retrieved September 18, 2010. ^ Millman, Joyce (September 11, 2000). "Don't blame me, I voted for Martin Sheen!". Salon.com. Retrieved December 10, 2005. ^ "The Thick of It: cynical, cruel and lacking in heart". The Guardian. October 23, 2009. Retrieved November 11, 2009. ^ Havrilesky, Heather (May 14, 2003). "Will The West Wing go south?". Retrieved December 10, 2005. ^ "Extended Interview: Aaron Sorkin". PBS.org. September 27, 2000. Retrieved September 23, 2011. ^ Beavers, Staci L. "The West Wing as a Pedagogical Tool." PS: Political Science & Politics. December 24, 2001. Reprinted in The West Wing: The American Presidency as Television Drama. Edited by Peter C. Rollins and John E. Connor. 2003. ^ Kaddour, Hédi (2012). "From Dream to Invention: 'The West Wing'". MLN. 127 (5): 1071–1095. doi:10.1353/mln.2012.0136. JSTOR 43611282. ^ Helm, Brendan Carlin (February 2, 2006). "Blair's whips fooled by West Wing plot". The Daily Telegraph. Retrieved November 10, 2013. ^ Trex, Ethan (January 26, 2014). "Andrew Jackson's Big Block of Cheese". mental_floss. Retrieved January 18, 2015. ^ Begley, Sarah (January 16, 2015). "The White House 'Big Block of Cheese Day' Is Back". Time. Retrieved January 18, 2015. ^ Lindsay, Erin (January 29, 2014). "The First-Ever Virtual "Big Block of Cheese Day" – The White House is Open for Questions". whitehouse.gov. Retrieved January 18, 2015. ^ a b Hall, Ellie (January 16, 2015). "The "West Wing" Cast Reunited For A Video About The White House's "Big Block Of Cheese Day."". BuzzFeed. Retrieved January 18, 2015. ^ Wall, Alex (January 16, 2015). "Big Block of Cheese Day Is Back, and It's Feta Than Ever". whitehouse.gov. Retrieved January 18, 2015. ^ Manchester, Julia (April 29, 2016). "C.J. Cregg makes a return to the White House". CNN. Retrieved December 18, 2017. ^ Pfefferman, Naomi (October 11, 2001). "The Left 'Wing'". Jewish Journal. Retrieved November 11, 2009. ^ de Vise, Daniel (May 15, 2006). "City Says Goodbye to 'West Wing,' Its Chattier Self". The Washington Post. Retrieved November 11, 2009. ^ "The war on culture". New Statesman. May 21, 2007. Retrieved November 11, 2009. ^ Lehmann, Chris. "The Feel-Good Presidency: The Pseudo-Politics of The West Wing." Reprinted in The West Wing: The American Presidency as Television Drama. Edited by Peter C. Rollins and John E. Connor. 2003. ISBN 0-8156-3031-X. ^ Savage, Luke (June 7, 2017). "How Liberals Fell In Love With The West Wing". Current Affairs. Retrieved August 2, 2018. ^ Helmore, Edward (July 23, 2017). "Leftwing Breitbart? Chapo Trap House is strong new voice in resistance to Trump". The Guardian. ISSN 0261-3077. Retrieved January 31, 2019. ^ "'West Wing' goes more bipartisan". MSNBC News. September 18, 2003. Archived from the original on February 13, 2005. Retrieved November 10, 2013. ^ Owens, Mackubin T (February 2001). "Real Liberals versus the West Wing". John M. Ashbrook Center for Public Affairs at Ashland University. Retrieved November 10, 2013. ^ Fonseca, Nicholas (August 9, 2002). "The Lowe Down". Entertainment Weekly. Retrieved August 8, 2014. ^ Burkeman, Oliver (May 6, 2003). "Next week on The West Wing ... erm". The Guardian. Retrieved December 10, 2005. ^ Smith, Greg M. "The Left Takes Back the Flag". Retrieved December 10, 2005. ^ "West Wing' sets Emmy record". CNN.com. September 11, 2000. Retrieved September 23, 2011. ^ "Best of the Decade: Emmy Winners". TV Guide. Archived from the original on November 10, 2013. Retrieved November 10, 2013. ^ Elderkin, Beth (September 11, 2016). "Game of Thrones Becomes the Most-Awarded Drama in Emmy History". io9. Retrieved September 11, 2016. ^ "The West Wing". Academy of Television Arts & Sciences. Retrieved November 10, 2013. ^ "The West Wing (NBC)". The Peabody Awards. 1999. Retrieved September 29, 2014. ^ "The West Wing (NBC)". The Peabody Awards. 2000. Retrieved September 29, 2014. ^ "Your Favorite TV Casts". TV Guide: 11. January 3, 2011. ^ "44 Fake Presidents From Worst to Best". The Wall Street Journal. July 12, 2016. Retrieved July 24, 2016. ^ "Nielsen Ratings For 1999–2000". SFGate. May 26, 2000. Retrieved February 2, 2014. ^ Armstrong, Mark (May 25, 2001). "Outback in Front: CBS Wins Season". E! Online. Retrieved November 10, 2013. ^ "How did your favorite show rate?". USA Today. May 28, 2002. Archived from the original on October 15, 2015. Retrieved November 10, 2013. ^ "Rank And File". Entertainment Weekly. June 6, 2003. Retrieved November 10, 2013. ^ "I. T. R. S. RANKING REPORT. 01 THRU 210 (OUT OF 210 PROGRAMS). DAYPART: PRIMETIME MON-SUN". ABC Medianet. June 2, 2004. Archived from the original on February 8, 2007. Retrieved September 23, 2011. ^ "I. T. R. S. RANKING REPORT. 01 THRU 202 (OUT OF 202 PROGRAMS). DAYPART: PRIMETIME MON-SUN". ABC Medianet. June 1, 2005. Archived from the original on March 10, 2007. Retrieved September 23, 2011. ^ "Series". The Hollywood Reporter. May 26, 2006. Archived from the original on May 22, 2010. Retrieved September 23, 2011. ^ Poniewozik, James (October 3, 2014). "The West Wing at 15: Walking, Talking — And Preaching". Time. Retrieved August 17, 2016. ^ Mikkelson, Barbara. "Letter to Dr. Laura". Snopes.com. Retrieved November 10, 2013. ^ Kerr, Gail (December 24, 2001). "West Wing aids MS awareness". The Tennessean. Retrieved November 10, 2013. ^ Carter, Bill; Rutenberg, Jim (September 15, 2001). "AFTER THE ATTACKS: TELEVISION; Viewers Again Return To Traditional Networks". The New York Times. Retrieved November 4, 2013. ^ Poniewozik, James (October 4, 2001). "'West Wing': Terrorism 101". Time. Retrieved September 18, 2010. ^ Wild, Diane (June 1, 2005). "The West Wing: The Complete Fourth Season". DVD Verdict. Archived from the original on September 30, 2007. Retrieved April 3, 2007. ^ Clabby, Consuela (October 31, 2005). "Leaky Politics: The West Wing versus The Bush Administration". SMRT-TV. Retrieved November 10, 2013. ^ Sims, David (September 12, 2014). "A Definitive Ranking of Every Character on The West Wing". The Atlantic. Retrieved August 18, 2016. ^ Roots, Kimberly (November 9, 2014). "Newsroom Premiere Recap: Boston, Bridesmaids and ACN's Brutal Future". TVLine. Retrieved December 18, 2014. ^ "'West Wing' eyes successor for Bartlet". USA Today. October 13, 2004. Retrieved November 4, 2013. ^ Steinberg, Jacques (April 10, 2006). "'West Wing' Writers' Novel Way of Picking the President". The New York Times. Retrieved April 10, 2006. ^ Jonathan Freedland (September 2008). President Hollywood. BBC Four. ^ Bayley, Matthew (February 14, 2008). "Barack Obama stars in the West Wing?". The Daily Telegraph. Retrieved November 11, 2009. ^ Simmons, Jamal (February 20, 2008). "In Presidential Campaign, Life Imitates TV". Politico. Retrieved November 10, 2013. ^ Smith, Ben (April 5, 2010). "Imagining Obama on 'The West Wing'". Politico. Retrieved November 10, 2013. ^ Freedland, Jonathan (February 21, 2008). "From West Wing to the real thing". The Guardian. Retrieved November 11, 2009. ^ Ballard, Janette (September 15, 2008). "Haven't we seen this election before?". BBC News. Retrieved November 11, 2009. ^ Stelter, Brian (October 30, 2008). "Following the Script: Obama, McCain and 'The West Wing'". The New York Times. Retrieved March 28, 2010. ^ Baldwin, Tom (November 7, 2008). "Rahm Emanuel's commitment to family and country is weighed up after White House offer". The Times. Retrieved September 21, 2011. ^ Martin, Rachel (November 7, 2008). "Rahm Emanuel Tackles the White House". ABC News. Retrieved November 22, 2008. ^ David Bender, Host. Lawrence O'Donnell, Guest. (November 9, 2008). "Politically Direct". Politically Direct with David Bender. 14:17 minutes in. Air America Radio. Archived from the original on February 3, 2009. ^ Lawler, Richard (November 5, 2010). "All seven seasons of The West Wing finally available in HD... but only online". Engadget. Retrieved June 22, 2018. ^ NBC press release, "July 19, 2001 -- NBC next season will broadcast its popular, critically acclaimed and Emmy Award-winning “The West Wing” (Wednesdays, 9-10 p.m. ET) in a special format – “Presented in Wide Screen” – just as the network has done with television’s top-rated drama, “ER,” last season." ^ Challen, Paul C. (October 1, 2001). Inside the West Wing: An Unauthorized Look at Television's Smartest Show. ECW Press. p. 200. ISBN 978-1550224689. ^ Sorkin, Aaron (June 3, 2002). The West Wing Script Book. Newmarket Press. p. 406. ISBN 978-1557044990. ^ Jackman, Ian; Ruditis, Paul (January 8, 2002). The West Wing (The Official Companion). Pocket. p. 342. ISBN 978-0743437400. ^ Rollins, Peter (April 1, 2003). The West Wing: The American Presidency as Television Drama. Syracuse University Press. p. 272. ISBN 978-0815630319. ^ Parry-Giles, Trevor; Parry-Giles, Shawn J. (March 13, 2006). The Prime-Time Presidency: The West Wing and U.S. Nationalism. University of Illinois Press. p. 248. ISBN 978-0252073120. ^ McCabe, Janet (December 3, 2012). The West Wing (TV Milestones Series). Wayne State University Press. ISBN 978-0814334362. ^ Handscombe, Claire (May 14, 2016). Walk with Us: How the West Wing Changed Our Lives. CH Books. ISBN 978-0997552317. ^ Pappas, Alex (November 29, 2010). "Die-hard 'West Wing' fans keep show going by assuming characters identities on Twitter". The Daily Caller. Retrieved April 29, 2012. ^ "'The Rachel Maddow Show' for Wednesday, December 8th, 2010". NBC News. December 9, 2010. Retrieved April 29, 2012. ^ "CNN's Gut Check for April 10, 2012". CNN.com. April 10, 2012. Retrieved April 29, 2012. ^ Viebeck, Elise (December 7, 2010). "White House takes Twitter question from ghost of fictional character". TheHill. Retrieved April 29, 2012. ^ Cohn, Alicia M. (January 26, 2012). "Biden answers question from fictional 'West Wing' character". TheHill. Retrieved April 29, 2012. ^ Grabenstetter, Jenn (January 11, 2012). "11 Outrageously Obscure 'West Wing' Characters Who Resurfaced on Twitter". Mental Floss. Retrieved April 29, 2012. ^ "'The West Wing Weekly' Podcast Promises To Break Down Every Episode". NPR. March 20, 2016. Retrieved December 18, 2017. ^ Gilbert, Matthew (February 14, 2018). "'West Wing' fans really miss their fictional White House". The Boston Globe. Retrieved March 2, 2018. ^ Silman, Anna (November 14, 2014). "The art of the Aaron Sorkin parody: A brief history of our obsession with spoofing Hollywood's most spoof-able writer". Salon. Retrieved March 2, 2018. ^ Wilmore, Alison (May 1, 2012). "Watch: 'West Wing' Cast Reunites to Spoof the Walk and Talk on Funny or Die". IndieWire. Retrieved March 2, 2018. ^ Lutes, Alicia (November 15, 2014). "Seth Meyers' Aaron Sorkin Parody Sketch Out-Sorkins All the Other Sorkin Sketches". Nerdist. Retrieved March 2, 2018.